Jangsaeng Doraji (Broad Bellflower), which are grown with the clean air and dews of Jirisan Mountain, is a gift from nature. 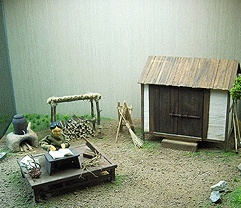 One day, a boy named Lee Seong-ho was cutting woods in a mountain with an old man. The old man in his 50s, which was already considered to be old at that time, managed to gather a load of firewood despite his sick body. While taking a break, he fell asleep after eating the roots that he dug out. As it became dark, the boy tried to wake him up, but he failed to do so. After some time of trying, he could not help but return to the village all by himself and let the others know that he had left the old man in the mountain. People said that the old man must have eaten excellent medicinal herbs and would soon wake up, assuring him to not worry. After three days, the boy went to the old man’s house and found that he was not there. He found the old man still sleeping in the mountain. After collecting firewood, the boy finally succeeded to wake up the old man. The old man, who used to be very weak and sick with his worsening disease, looked totally different and became much more energetic and powerful than before. In addition, his condition got better and better, until eventually, he recovered from his illness. 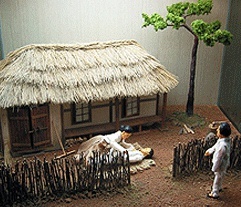 Lee Seong-ho made up his mind to cultivate the long-surviving doraji with a firm conviction that “men should do one right thing during their lives.” He thought that, if the old doraji could save the lives of dying people, he should grow it in large quantities to help many as many patients as possible. He thought that, if saving a person from flood is an act that deserved to be praised, then he could live a truly valuable and meaningful life if he can save many lives with doraji. That was how he started growing the long-surviving doraji. However, growing doraji is not an easy task to do as it normally survives for only three years. During that time, no one knows how to grow doraji for a long period of time, not even a single person. He only even learned how to read for the sake of farming and combed through many oriental medicine books only to find the diagnosis and efficacy of the three-year-old doraji. He could not help but rely on his own experiment, that is, using various kinds of farming methods and fertilizers. 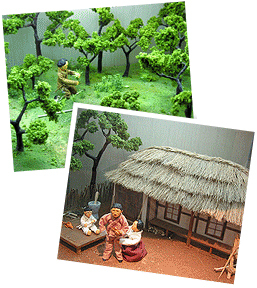 However, the doraji he planted in various ways on land stretching thousands of pyeong failed to live more than three years without exception. For each time that it happened, he plowed up the field and sowed seeds again. While he kept doing it repeatedly for several years, he became worse off. While the debt he owed to cultivate doraji was piling up, his children got shabby. Even the kids in the village ridiculed Lee, calling him a crazy guy. He could not have accepted himself if he gave up just like that. Lee Seong-ho went to an uninhabited valley of Jirisan Mountain with a pack of salt and a hoe. He thought he could be fully committed to thinking about doraji only in such a place that is free from the negative ideas of people. He believed that he needed to forego trivial things to achieve something bigger and more important, and bear the pain of ignoring the sufferings that his wife and children have to go through. While he was barely living his life eating crawfish, frogs, and kudzu roots; replanting all doragi near his temporary hut; or crossing doragi of different looks with others in mountains full of savage beasts, he was gradually becoming to look less like a human. His hair got disheveled and his eyes became sharp, just like those of a wild animal. 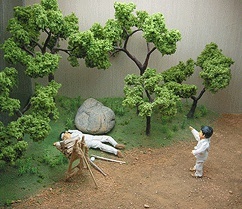 Even some simmani (ginseng diggers) get frightened of him and run away every time they encountered him. One day, in the fifth year since he became crazy about doraji in the mountains, he found a bud of doraji coming out of barren soil, which looked like a plant that was not able to survive. To his surprise, it was coming out of the rotten doraji that he indifferently planted in the soil about a month ago just because did not want to throw it away. That was the moment when he realized the providence of nature. The secret of the life of doraji, which had failed to survive more than three years despite of all the farming skills that he tried for the last 15 years, was found in nature. What it really needed was not fertilizers or nutrient substances made by men but the energy that comes directly from pure land. In short, the doraji was reviving by absorbing energy from the seemingly barren soil on which it was indifferently planted. He plunked himself down and burst into tears of joy and gratitude. He was immensely grateful toward the heavens for making him realize divine wisdom after all his efforts. That was in 1970, 15 years after he started focusing his life on doraji. By 1988, he came to have doraji that have lived for more than 10 years. Looking back, the development process had been a difficult and important time for him. As there had been rumors that there was medicinal doraji of more than 10 years old, people throughout the country rushed toward his dwelling to buy some. His families, who went through painful suffering, were filled with hope that they could finally be better off. 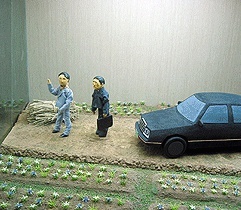 However, Lee Seong-ho could not sell a single root of doraji. He had to figure out why the old doraji is excellent and how it works. He did not even know how old doraji should be to be worthy to be called “medicinal.” It was against his consciousness to sell his product without any obvious evidence. It was more heartbreaking to let people come to him with piles of money and have them go back to their starved families than to live by himself in the deep mountains in complete loneliness. He began to be worn out because of the matter, which looks more difficult and vague than growing doraji for a longer period. Hearing complaints from his families saying, “it would have been better to live a life without any hope for doraji” led for him to feel guilt and self-accusation, until, eventually, he reached the point in which he decided to give up doraji completely. At that point, Lee gave up not only the cultivation of doraji, but everything that was related to the plant. He was afraid that anyone of his descendants would start working again because he did not even know what kinds of pain could follow. It could result to bigger and more painful hardships than anything he has experienced so far. He burned down every notebook that he has made, which contained detailed records for tens of years. He cried in sorrow and pain while looking at all his efforts and records turning into a fistful of ashes. In addition, he started throwing away all the doraji liquors that he has produced according to the year of production. While he was doing it one bottle after another, he found something. He found out that the colors of the liquors made with 20-year-old and 21-year-old doraji turned out to be different. He remembered that he made the liquors both at the same time and on the same day, but that produced with the 21-year-old doraji was darker in color. Mr. Lee started to see professors and asked them to analyze his 22-year-old doraji wine. 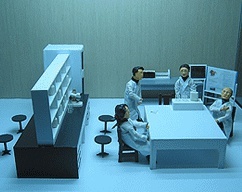 At first, all that he got was a chilly response saying, “doraji is doraji; there must be no special result.” After several repudiations, however, he finally got his doraji wine analyzed by the Food Engineering Department of Gyeongsang National University. The result showed that his 22-year-old doraji had obviously different characteristics compared to the ordinary three-year-old ones. Based on this result, he applied for a patent, but again, he was treated as if he was a man who is out of his mind. No wonder that people thought like that because it would not be that simple to obtain a patent for such a common produce that you could find anywhere. It seemed that they were just longer-living ordinary crops. 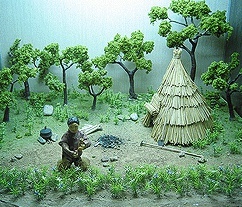 However, his unrealistic passion and tenacity was rewarded by acquiring a patent for his farming technology with regard to his doraji that has a unique and unprecedented feature. Afterward, he has continued to focus on his study by borrowing money, the results of which demonstrated an indefinite potential for future development.